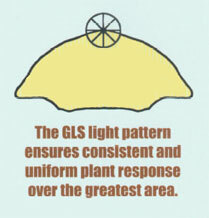 At nearly 90% efficiency, the GLX is delivering more usable light energy than any other reflector in the industry. This stellar performance allows greenhouse growers to significantly reduce the number of fixtures needed for growing success. Standard Features Ideal for low clearance situations. At nearly 90% efficiency, the GLX is delivering more usable light energy than any other reflector in the industry. This stellar performance allows greenhouse growers to significantly reduce the number of fixtures needed for growing success. Accepts 400 & 1000 watt MH and 1000 watt HPS. Reflector Size: 18.35"L x 12.25"W x 7.25"H"